Pacem in Terris (Peace on Earth) was a papal encyclical issued by Pope John XXIII on 11 April 1963. 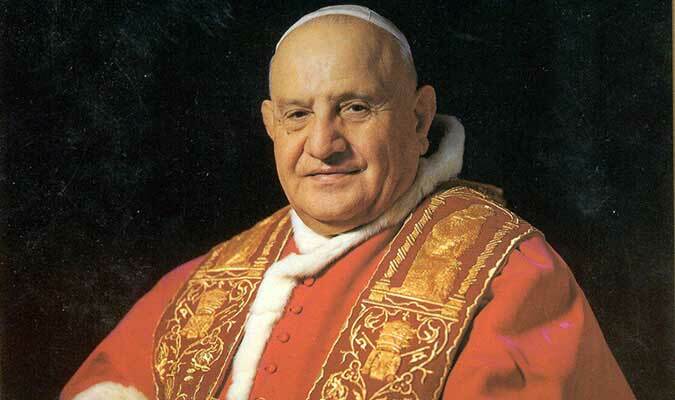 St. Pope John XXIII, born Angelo Giuseppe Roncalli (25 November 1881 – 3 June 1963), headed the Catholic Church and ruled Vatican City from 1958 until his death. t did not live to see it to completion. He died in 1963, only four-and-a-half years after his election, and two months after the completion of his final encyclical, Pacem in Terris. He was beatified, along with Pope Pius IX, on 3 September 2000. Pope Pius XI (31 May 1857 – 10 February 1939), born Ambrogio Damiano Achille Ratti, was Pope from 6 February 1922, and sovereign of Vatican City from its creation as an independent state on 11 February 1929 until his death on 10 February 1939. He issued numerous encyclicals including Quadragesimo Anno, highlighting capitalistic greed of international finance, and social justice issues, andQuas Primas, establishing the feast of Christ the King. He took as his papal motto, “Christ’s peace in Christ’s kingdom”. Venerable Pope Pius XII born Eugenio Marìa Giuseppe Giovanni Pacelli (2 March 1876 – 9 October 1958), reigned as Pope, head of the Catholic Church and sovereign of Vatican City State, from 2 March 1939 until his death in 1958. (2 March 1810 – 20 July 1903), born Vincenzo Gioacchino Raffaele Luigi Pecci , was the 256th Pope of the Roman Catholic Church, reigning from 1878 to 1903. He was the oldest pope (reigning until the age of 93), and had the third longest pontificate, behind his immediate predecessor Pius IX and John Paul II. He is known for intellectualism, the development of social teachings with his encyclicalRerum Novarum and his attempts to define the position of the Church with regard to modern thinking. He influenced Roman Catholic Mariology and promoted both the rosary and the scapular. He issued a record eleven encyclicals on the rosary, approved two new Marian scapulars and was the first Pope to fully embrace the concept of Mary as mediatrix. He is also the author of the St. Michael the Archangel prayer, among others. These are the four values of the Social Teaching of the Catholic Church as they’re enumerated in the Compendium and as they were laid out by, again, Blessed Pope John XXIII in Mater et Magistra and Pacem in Terris. Without these values, the work of social justice becomes an albatross around our necks. It pulls us down, threatening to poison all the work we do, no matter how well-intentioned.